Surround your home with the security and strength of a Leicht’s Products Weldmesh Fence, then relax. Weldmesh has strength and durability, and is galvanised for maximum toughness… extra protection built in to stand up to our harsh climate. 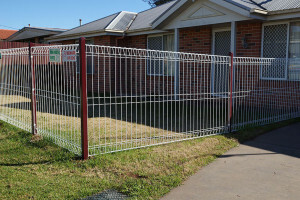 Use Weldmesh in the front yard or as a dividing fence. Weldmesh looks good anywhere. It keeps your kids in, and dogs out (or the other way around) and your plants will love it because Weldmesh Fencing makes an ideal support for climbing plants. If you want a strong, long-lasting economical fence, Weldmesh is the one.